Eugène Bataille (Mans, May 7, 1854 - Clermont (Oise), June 10, 1891, better known under his pseudonym Arthur Sapeck) was a French artist and illustrator who was known to travel the streets with his head painted blue. 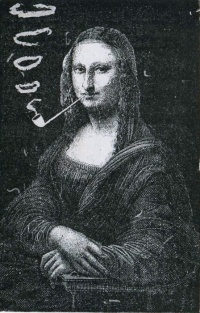 In the second show of the Incoherents in 1883, he contributed an 'augmented' Mona Lisa (Mona Lisa Smoking a Pipe) that directly prefigures the famous Marcel Duchamp image L.H.O.O.Q. of 1919. Encyclopédie des farces et attrapes et des mystifications, sous la dir. de François Caradec et Noël Arnaud, Éditions Jean-Jacques Pauvert, 1964. Marc Décimo, Marcel Duchamp et l'érotisme, Dijon, Les presses du réel, « Préliminaires », 2008. Unless indicated otherwise, the text in this article is either based on Wikipedia article "Eugène Bataille" or another language Wikipedia page thereof used under the terms of the GNU Free Documentation License; or on original research by Jahsonic and friends. See Art and Popular Culture's copyright notice. This page was last modified 09:29, 12 July 2014. This page has been accessed 11,848 times.